A credit rating system creditors use to help determine whether to give you credit and how much to charge you for it. If you have ever applied for a credit card, loan, or insurance, then there is a file about you known as your credit report which will include your quality score rating. It is important to check your credit report for accuracy from time to time. This file has information about you and your credit experiences, bill paying history, the number and type of accounts you have, late payments, collection actions, outstanding debt, bankruptcies, and the age of your accounts, collected from your credit application and your credit report. Using a statistical formula, creditors compare this information to the performance of consumers with similar profiles. A credit scoring system awards points for each factor. A total number of points, known as a credit score, helps predict how creditworthy you are, that is, how likely it is that you will repay a loan and make the payments on time. Generally, consumers with good credit risks have higher credit scores. The quality of your credit rating can impact your ability to get credit, insurance and employment. Having good credit means it will be easier for you to get loans at lower interest rates. Lower interest rates usually mean lower monthly payments which save you money. Do you have bad or poor credit? Do you want to improve your creditworthiness and credit rating? Then you are on the right track, and there are proven steps you can take on your own to make this happen. Now for the bad news. Only time and effort, along with a personal debt repayment plan will improve your credit report and rating. 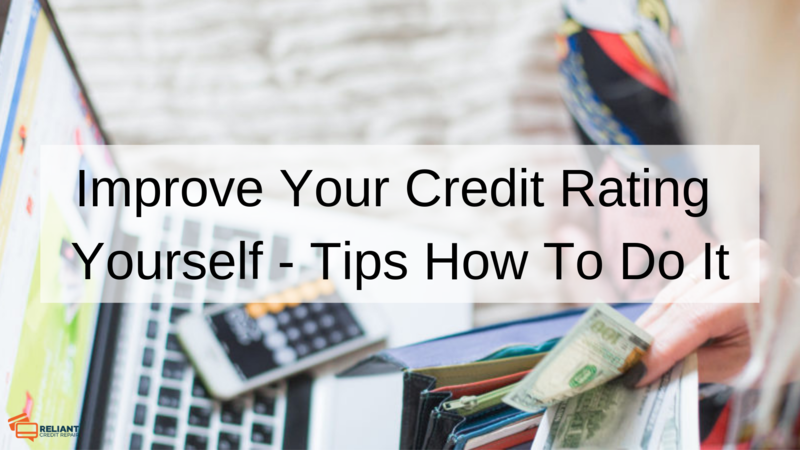 The good news is that you can do all of the things necessary to improve your credit rating by yourself at little or no cost. Step 1. Develop a personal budget. Take control of your financial situation by doing a realistic assessment of how much money you take in and how much money you spend each month. List your income from all sources. Then, list your “fixed” expenses, those that are the same each month, like mortgage payments or rent, car payments, and insurance premiums. Next, list the expenses that may change or vary from month to months like food, entertainment, recreation, and clothing. Writing down all of your expenses, even those that may seem insignificant is a helpful way to get a grip on and keep track of your spending patterns, identify necessary expenses, and prioritise your expenditures. The main goal is to make sure you can make ends meet on the basic living necessities like housing, food, health care, insurance, and education. Step 2. Balance your chequebook. Yes, it seems common sense to do this, but you would be amazed at how many people either don’t know how to do it or just hate balancing their chequebook. If there is something on your bank account statement that is confusing or you just can not quite get right, then go see your banking representative for help. Either way, it is absolutely critical to control you, or it will continue to control you. Step 3. Create a plan to save money and pay down your debts. You might say hey, I can not pay all of my bills now, how am I going to save any money? That is why getting your budget under control is so critical. Cutting your monthly expenditures for items that are not needed will be necessary in order to get your budget under control. It sounds simplistic, but your goal is to have more money coming in each month than the amount of money you spend each month. Until you find a way to make this basic truth happen, you will not be able to pay off your debts and become more creditworthy in the eyes of lenders. Not quite sure how to accurately gather and itemise all of your monthly expenditures and compare them to your monthly income? You can find lots of helpful resources available online, at your local library, or at bookstores that address money management techniques, personal finance and budgeting. Step 4. Pay your bills on time. Goes without saying but it is necessary in order to show lenders that you are improving and are capable of making on-time payments each month. If you’re having trouble making ends meet then contact your creditors immediately. Tell them why it’s difficult for you, and try to work out a modified repayment plan that reduces your payments to a more affordable level. Don’t wait until your accounts have been turned over to a debt collector. At that point, your creditors have given up on you. These are some of the painful but necessary steps you must take in order to improve your creditworthiness and rating in the eyes of current and future lenders. So, embrace these steps and make it work for your needs.